Capt. 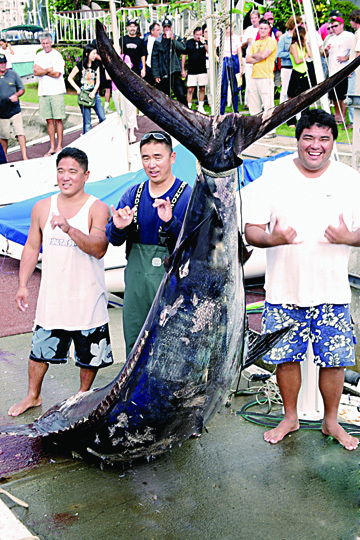 Kirk Inoue, his brother Guy and friend Wayne Watanabe hooked their 1012-lb blue on the second day of the Mitch's Sushi Shoot-Out. They were 22 miles south of Oahu near P-buoy dodging three funnel clouds and running at 13 knots when they took a hit on their center rigger. The marlin nabbed a 9-inch salmon-color skirted lure named the Sandbagger and fought until it was tail-wrapped and dead. They won the tournament, of course!